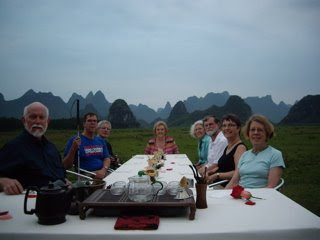 We parted from our patrons in Beijing and they went on to Guilin. From these photos they sent, it looks like a good time. Too bad there's not a new concert hall there for us to sing in - but the point of going to Guilin is to escape the massive urban environments and appreciate the magnificent and ancient landscapes. Our patron tours are organized by La Fugue in Paris which has done trips for us to Verbier in 2007 and Vienna-Prague-Budapest last year. 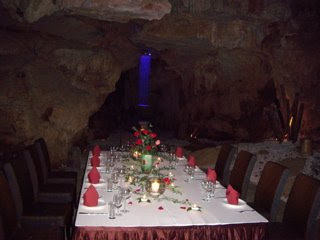 Their specialty is surprises along the way - ie events not listed in the itinerary - such as this dinner in a cave and tea in front of one of the world's most beautiful landscapes.